When I first started cooking, risotto was always a dish that I never wanted to try. For some reason I had this vision of myself chained to the stove, stirring for hours on end and never getting anywhere. Also, my roommate at the time asked me to make it so often that it became a running joke, and I never wanted to cave to his demands. You can never back down in a passive-agressive roommate struggle; it shows weakness. But maybe if I hadn’t been so stubborn, I would have discovered this easy, delicious dish a lot earlier. Risotto can sound intimidating to a lot of people, but in reality, it’s pretty hard to screw up and can be a convenient way to clear out your pantry. If you have canned tomatoes or half an onion or any other random vegetable, just throw it in some risotto and you have a solid dinner. 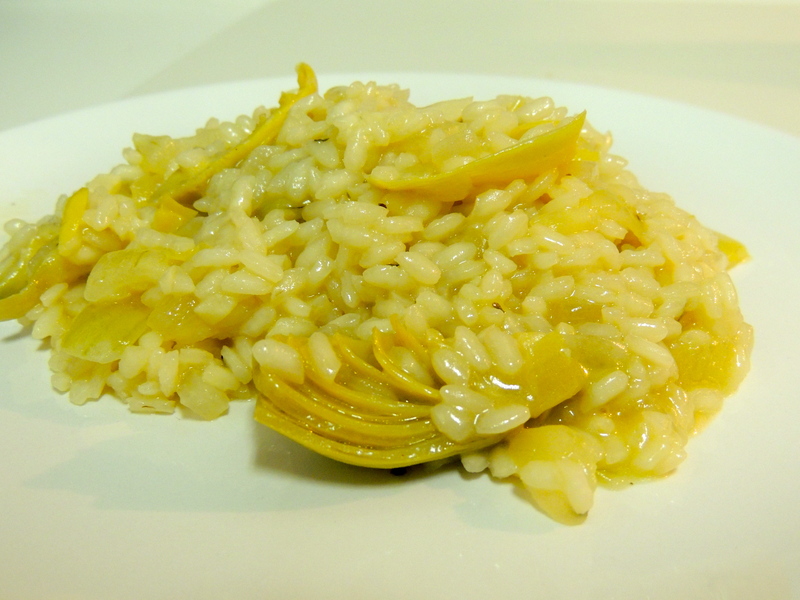 One of my favorite risotto add-ins is artichoke hearts, so that’s what I’ve shown in this recipe. The nice thing about this dish is you can sit there and watch the rice transform into the risotto you’re about to eat; you just need a little patience and a fork nearby so you can taste your work. This gallery should show the progression as the risotto comes together (it’s much easier to tell in person). Pour chicken stock into a saucepan and put it on the back burner on low to warm as you chop the vegetables. Dice the onion and mince the garlic. On the front burner, melt butter with olive oil over medium heat. Add onions and saute until softened, 5-7 minutes. Add garlic and stir, cooking for another minute or so. Add rice and toss to cover in oil, cooking for another couple of minutes. Add in your wine and stir. The wine will be absorbed pretty quickly. Once the pan looks dry, add a couple of ladlefuls of chicken stock. Stir the mixture a little and let it cook. Stir frequently, but it doesn’t have to be constant. Your rice will begin to give off starch and look creamier. Add another ladleful of stock each time the pan begins to look dry. After 5 or so total ladles of stock going in, you can give your risotto a taste. You want the rice to be al dente, firm but not crunchy. You’re cooking it, so just stop adding stock when you like the texture. Just before your risotto is done, add the entire jar of artichoke hearts. Give it a few minutes and stir to incorporate. Grate the cheese over the pan to taste; I added about a quarter cup of pecorino to mine. Stir in cheese and you’re ready to eat.